In nowadays society, the number of persons travelling by airplane raised significantly. In this situation, normally the number of flights rose, but this category of transportation was not indemnified against certain problems, meaning the loss and deterioration of luggage, refusal to board, the delay of annulment of flights. In certain situations, these inconvenient were solved sometimes quickly, sometimes slowly, sometimes satisfactorily or not, but it is certain that the majority of passengers is not aware of its rights when dealing with cases similar to the ones above mentioned. In this context, in this article we shall present the rights of passengers in each of the stated cases. 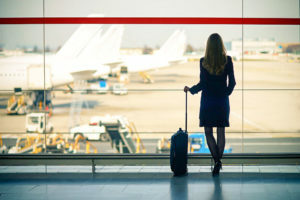 If the luggage handed-over at check-in were lost, damaged or they arrived in delay, the liability belongs to the flying company and the passenger has the right to a compensation of approximately 5,455 lei. But if the damages were caused by a default of the luggage, the right to compensation does not exist. In respect of the hand luggage, if this is damaged during the trip, the liability belongs to the flying company only if the damage was caused by its fault. On the other hand, if the luggage contain expensive articles there is the possibility that the passengers, in exchange of a fee, to request a larger compensation (over 5,455 lei). For this, they should address to the flying company to give a statement in respect of the content of luggage, the latest upon check-in. This does not supersede the possibility of passengers to conclude a private travel insurance, which sometimes may represent a satisfactorily cover. The refusal to board refers to the situation in which the passengers presented at check-in in due time, with a valid booking and all the necessary travel documents, but he was refused boarding due to over-booking or due to operational reasons, and he is not willingly renouncing his seat. 600 EUR for all the flights not regulated under (a) or (b) above. If the flight operator redirected the passenger to another flight and he reached his final destination with a delay of 2 hours in respect of the distance provided by letter (a), 3 hours in respect of the distance provided by letter (b) or 4 in respect of the distance provided by letter (c), the value of compensation may be reduced by 50 %. These rules are not absolute, and therefore, following a concrete evaluation it may be concluded that the passenger was unjustly refused boarding with the reason that he was late due to the fact that the first flight was delayed, respectively that he is not entitled to compensation due to the fact that he did not board for the leaving flight (two-way reservation). Another reservation at a subsequent date. Once chosen between the three possibilities, the flight company shall be exonerated of liability, with the exception of certain situations, as the one in which the operators does not leave the possibility of choosing between reimbursement and redirecting, but it unilaterally decides to reimburse the price of the initial ticket, therefore the passenger having the right to a supplementary reimbursement of the price difference between the initial and the new ticket, under comparable transport conditions. 2 telephone calls or 2 messages (telex, fax, e-mail). If the flying company does not provide assistance and the passenger purchases his own soda and snacks, the flying company must reimburse the price thereof, as long as the expenses made were necessary, reasonable and adequate and, of course, provided that the invoices are kept as proof. Similarly, if the delay is of at least 5 hours, the passenger shall have the right to the reimbursement, within 7 days, of the cost of the ticket together wit, if the case may be, a return ticket to the initial point of leaving, as soon as possible . It must be noted that, by the connected Clauses C-402/7 and C-432/07, Sturgeon & the others, ECLI:EU:C:2009:716, item 69, the Court decided that a delayed arrival of at least three hours, gives the same rights for compensation as the annulment, as we shall detail below. This aspect must be interpreted in the sense that, in practice, even if a flight may be generally considered as annulled, for example when the flight number changes, the respective flight may be considered as delayed, not annulled, and this must be evaluated from case to case. The annulment takes place, in principle, when the planning of the initial flight is abandoned, and the passengers of this flight join the passengers of a flight which was also planned, but independently of the initial flight. It is not provided that there must exist an express decision of annulment by the transporter and the display of a “delay” or “annulment” on the panels of departure flights situated in the airport or the announcement thereof by the personnel of the air transporter, is not of the nature to conclude that there existed a delay or annulment. The notion of „annulment” covers also the case of an airplane which takes off, but due to whatever reason it is subsequently forced to land back in the departure airport, where the passengers of the respective airplane are transferred to another flights. 75 % of the price of the ticket for all the flights not regulated under (a) or (b) above, including the flights between the European territory of the member states and the French departments overseas. On the other hand, the transporter has the obligation to publish the following message in the area of registration of passengers, so it may be clearly visible to them, in as many relevant languages as possible, on paper or electronically: In case of a refusal to board or in case your flight is annulled or delayed with at least two hours, please request at the boarding gate or at the registration office a note stating your rights, especially regarding compensation and assistance. Moreover, the transporter which refuses the boarding or which annuls a flight, shall present to each passenger a written communication in which there shall be provided the norms for compensation and assistance according to the Regulation (EC) No. 261/2004 of 11 February 2004 for the establishment of certain common norms in the field of compensation and assistance of passengers in case of refusal to board and the annulment or extended delay of the flights and for the abrogation of the Regulation (EEC) no. 295/91. Moreover, the transporter shall present an equivalent written communication to each passenger affected by a delay of at least two hours. The passenger must also be provide, in writing, the coordinates of the national institution responsible with the enforcement of the above mentioned regulation in respect of the flights on the airports located within their territory and the flights from a third country towards these airports, this institution being in Romania, the National Authority for Consumers Protection. Distinctly, we state that the transporters are exonerated of liability if they prove that a certain event was caused by extraordinary circumstances which could not be avoided even though they took all the possible measures, but, on one hand, a compensation is always due in case of refusal to board and the air transporters cannot validly justify a case of refusal to board and be exempted from the payment of compensation to passengers, by invoking extraordinary circumstances, and on the other hand, the technical problems do not represent the extraordinary circumstance, unless it is proved to be incident to the normal exercise of activity of the respective air transporter and that it falls outside the effective control thereof due to its nature and origin. Last but not least, we state that in this present article we did not take into account the provisions of the Council Directive 90/314/CEE of 13 June 1990 regarding the packages of services for travels, trips, holidays and touristic circuits, these being unaffected.